Little is known about who issued them, since most were just small traders and people like them usually don’t get a mention in history. Where possible, I have added scraps of information gleaned from local histories and local archaeological socieites. These notes appear as purple-coloured italic text. Obverse: ROBART . MELDRVM = A lion rampant crowned. Reverse: OF . ANAMO … = 1D. Obverse: MATTHEW . BETHELL = An ornamented knot. 1671. Reverse: POST . MSTR . IN . ANTRIM = M. B. 1D. Obverse: BRYCE . CRAFORD = 1657. 1D. Reverse: ANTRVM . MARCHT = B . C. A merchant’s mark. Obverse: WILLIAM . CRAFORD = A merchant’s mark. Reverse: IN . ANTRVM . MERCHANT = 1656. Within a heart I, above it D.
A variety, better engraved, having the date 1657, and the initial letters W . C.
Reverse: IN . ANTRVM . MERCHANT = 1657. Within a heart I, above it W. C.
Obverse: THOMAS . PALMER. IN = Unknown. Reverse: ANTRIM . MARCHANT = Unknown. Obverse: GILBERT . ROSS = Unknown. Reverse: IN . ANTRIM = Unknown. Obverse: SAMVELL . SHENNAN . 68 = A coat-of-arms, defaced. Reverse: IN . ANTRM . MARCHT = S . S. 1D. Obverse: IOHN . STEWARD . OF = A merchant’s mark. Reverse: ANTRIM . MARCHANTT = I . S. 1D. Obverse: WILL . STEWART . IN = 1D. 1656. Reverse: ANTRVM . MARCHAN = W . S.
Obverse: IOH . VAVCH . MARCHT = Arms : three boars’ heads. Reverse: IN . ANTRIM = 1D. Obverse: IOHN . WHITE . OF = The Grocers’ Arms. Reverse: ANTRIM . MARCHANT = I . W . 1D. Obverse: ROBART . YOVNG = Unknown. Reverse: DYER . IN . ANTRIM = R . Y. 1D. Obverse: WILL . PINCKLON = Device uncertain. Reverse: IN . AOLREE = 1D. Reverse: HIS . PENNY . 1670 = A goat. Obverse: IAMES . ATKINSON . OF = St. George and the Dragon. Reverse: ARTERDE . MARCHANT . HIS = 1D. Obverse: THO . ROBEREY = 1D. 1670. Reverse: MERCHANT . OF . ARDEE = T . R. and a merchant’s mark. Obverse: TOBY . SKERNE . 1666 = Arms : two castles and two lions rampant quarterly. Reverse: IN . ATHERDEE . MAR = T . S. 1D. Obverse: IOSEPH . BAYLY = Two grasshoppers under three castles, with flags. Reverse: OF . ARCKLOW . MARCHANT = 1D. Obverse: SIMON . SHEEHAN = A man on horseback. Reverse: OF . ARKLO . MARCHA = 1D. Obverse: IOHN . DAVISON . OF = A stag at full speed. Reverse: ARDMAGH . 1671 = I. D.
Obverse: IOHN . HOLMES = Two stars, an acorn, and two oak-leaves. Reverse: OF . ARDMAGH . MAR = A merchant’s mark between I . H.
Reverse: OF . ARDMAGH . MART = A heart pierced with an arrow. 1D. Obverse: THOMAS . SANDERS = Arms : three crescents (?). Reverse: OF . ARDMAGH . MAR = 1D. Obverse: IOHN . SINKLER . OF = A ship. Reverse: OF . ARDMAGH . MERCHANT = In a heart I, above it D. I . S.
Obverse: IAMES . TAYLOR . MARCHT = Armagh Cathedral. Reverse: IN . ARDEMACH . 1664 = I . M . L. 1D. Obverse: IOHN . HILLHOVSE . MARCH = A heart pierced with two arrows. Reverse: OF ARTICILIE = I . H. Merchant’s mark. Obverse: MATHEW . NARLAN = M . N . 1D. Reverse: ATHBOY . MARCHANT = A lion rampant. Obverse: IOHN . RIGGS . MERC = A fleur-de-lys. Reverse: IN . ATHBOY = I . R.
Obverse: THOMAS . CLOAN . OF = A lion rampant and a harp. Reverse: ATHENRY . MERCHANT = 1D. The first charter of the town of Athlone was granted by Queen Elizabeth I in 1599 but nothing is known of its contents – a few years later, King James I renewed the charter. Obverse: WILL . ANTRIBVS = A. A swan swimming. Reverse: IN . ARTHLON = 1D. There is still an Antrobus Arms Hotel in Athlone today, so the surname on the token seems to have blundered the name Antrobus for Antribus. Obverse: HVGH . COFFY . IN = 1D. Reverse: ATHLONE . MARCHANT = A swan and castle. Obverse: WALTER . DOWDALL . OF = Arms : per pale two martlets, on a chief another. Reverse: ATHLONE . MARCHANT = W . B . D.
Obverse: RICHARD . EATON . OF = Arms of the Eaton family ; on a fesse three plates. Reverse: ATHLONE . CHANDLER = R. E.
Obverse: WILLIAM . FALLON = 1D. Reverse: OF . ATHLONE = A hand holding a pen. Obverse: WILLIAM . HILL . OF = A stag and eagle. Reverse: ATHLON . MARCHANT = W . H. 1656. Reverse: ATHLON . MARCHANT = W . H. 1663. Obverse: WILLIAM . IDATE = A bird flying. Reverse: OF . ATHLONE = W . E . I.
Obverse: RICHARD . KELLY . OF = 1D. Reverse: ATHLONE . MERCH = Three fishes. Reverse: ATHLOONE . MERCH = Three fishes. Obverse: WALTER . KELLY = 1D. Reverse: OF . ATHLONE = A spread-eagle. Obverse: IAMES . LENON . OF = I . L. 1D. Reverse: ATHLON . MARCHA = A stag at full speed. Obverse: WILLIAM . LORTE = A spread-eagle. Reverse: IN . ATHLONE = W . L . D.
Obverse: NICHOLAS . MALONE = Arms : on a bend three crosses moline. Reverse: ATHLONE . MARCHANT = NM. conjoined. Reverse: ATHLONE . MARCHANT = 1D. 1656. Obverse: GEORGE . MILLS . OF = A foliated branch erect. Reverse: ATHLONE . MARCHAN = 1D. Obverse: WILLIAM . MORHAD = A bird on a tree. Reverse: OF . ATHLON . MARCH = 1D. Obverse: MARTYN . MVRPHY = Unknown. Reverse: IN . ATHLONE . MARCHAN = Unknown. Obverse: ALDRIGE . SADLER = A . E . S.
Reverse: OF . ATHLONE . BAKER = A wheatsheaf. Obverse: IOHN . SLATTER . = A checkered square. Reverse: OF . ATHLONE . 1655 = I . S.
Obverse: STEPHEN . SMITH . OF = A leather-cutter’s knife. Reverse: ATHLONE . SHOOMAKER = S . S. 1D. Obverse: RICHARD . W . . . N . OF = Three castles, one and two. Reverse: ATHLONE . MARCHANT = R. W. 1D. Obverse: WILLIAM . ADDIS = 1D. Reverse: OF . ATHY . 1659 = A swan swimming. Obverse: IAMES . SWANTON = A lion rampant. Obverse: IAMES . WALSH = A double-headed eagle. Reverse: OF . ATHY . 1666 = 1D. Obverse: IAMES . MORIE = 1D. Reverse: IN . AVGHOR . MARCHT = A tree. Obverse: NIC . DANELL . OF = A heart pierced by two arrows. Reverse: BALLNAKILL = N . D.
Obverse: ROBERT . WARNER = POST MASTER. Reverse: IN . BALLINISLOE = 1D. Obverse: ROB . HVTCHINSON . 1668 = Crossed keys. 1D. Reverse: OF . BALLYBOY . MARCH = Two swords in saltire. Obverse: THO . MAIRE . OF = T . M . M.
Reverse: BALLYBOY . TANNER = An anchor. Obverse: IOHN . DALIN . 1668 = I . E . D.
Reverse: BALLYIAMES . DVFFE = The Mercers’ Arms. Obverse: IOHN . HARPER . OF = A lion playing on a harp. Reverse: BELLYMONY . MARCHANT = Two arrows in saltire on a heart. Obverse: DVNCAN . LINNE . MARCH = D . L . and a merchant’s mark. Reverse: BEEII . MONEY (sic) 1670 = A crane with a fish in its talons. Obverse: IOHN . SINKLER . OF = Arms in a shield. 1D. Reverse: BALLYMONEY = I . S. 1656. Obverse: THOMAS . CONNER . OF = A stork standing on its nest. Reverse: BALLIMORE . MARCH = 1D. Obverse: MARTINE . LYNCH . OF = Arms. Reverse: BALLOMORE . MARCHT = M . L. 1671. Obverse: EDMOND . PETTIT . OF = A winged horse. Reverse: BALLYMORE . MARC = 1D. Obverse: LVKE . TYRRELL . OF = 1D. Reverse: BALLIMORE . MERCT = Two swords in saltire. Obverse: DANNIELL . . . . LY = A harp. Reverse: BALLYMOATE . 1657 = 1D. Obverse: WILLIAM . PRIGG = A ship and castle. Reverse: OF . BALTEMORE = W . P.
Obverse: BANDON . PENIE . 1668 = Three castles. Reverse: 1D. BOYND . TO . CHANG . VS = B P and a merchant’s mark. Obverse: BANDONE . ARMES . 1670 = Three castles. Reverse: CORPERASION . PENIE = A bridge of three arches. Obverse: IOHN . WREN . OF . 1659 = Arms : a chevron between three wrens. Reverse: BANDON . BRIDEWELL = A building. Obverse: IAMES . CLEALARD = A church. Reverse: OF . BANGOR = An anchor. 1D. Obverse: IAMES . CLEALARD = An anchor and cable. 1657. Reverse: OF . BANGOR = A church. 1D. Obverse: IAMES . MOOR = Unknown. Reverse: OF . BANGOR . 1657 = Unknown. Obverse: IAMES . BIGGER . MARCHANT = B. A merchant’s mark. Reverse: IN . BELFAST . 1666 = 1D. within a heart. Obverse: IOHN . BIGGER = A bell. 1657. Reverse: OF . BELFAST = I . B. 1D. Obverse: MICHAELL . BIGGER = A bell. Obverse: IOHN . BVSH . BELLFAST (in four lines across the field). Reverse: 1D. (filling the whole field). Another, similar, reading BELFAST. This and the preceding are curious, from the circumstance of being struck on French doubles Turnois, temp. Louis XIII. ; part of the former legend is still visible on both sides. Obverse: IOHN . BVSH . BELFAST (in four lines across the field). Obverse: IAMES . CHALMERS . IN = Arms of the Chalmers family quarterly, first and fourth a mullet ; second and third a fess checky. Reverse: BELFAST . MERCHANT = I . C . 1D. 1670. Obverse: IOHN . CLVGSTON = 1D. 1657. Reverse: IN . BELFAST . 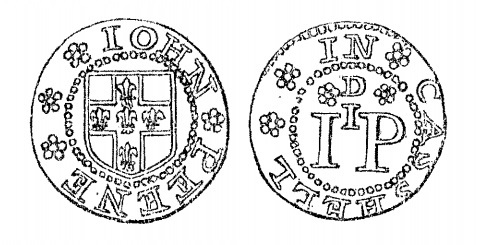 1657 = I . C.
Obverse: IOHN . CLVGSTON . IN = 1D. Reverse: BELFAST . MARCHT = I . C.
Obverse: IOHN . CORRY . OF = 1D. Reverse: BELLFAST . MARCHANT = I . C . 1656. Obverse: HVMPHREY . DOBBIN . OF = Arms : a chevron between three annulets. Reverse: BELFAST . MARCHT . 1670 = Crest : a lion’s paw holding an arrow. 1D. Obverse: BELFAST . 1671 = A knot, or A . Duff. Reverse: A ship in full sail. 1 . D.
Obverse: HVGH . DVOK = A bell. 1656. Reverse: IN . BELLFAST = H . D.
Hugh Duok was “Sovereign” of Belfast in 1646, at which time it is recorded of him, that he made his mark, declining his full signature. Obverse: HVGH . ECCLES . OF = Arms in a shield. Reverse: BELLFAST . MARCHANT = 1D. in a heart. Obverse: IOHN . GIVAN = A still. Reverse: IN . BELFAST = Arms quarterly ; first, three stars ; second, a crescent ; third, a heart ; and fourth, a stag’s head. Obverse: IOHN . KILPATRICK = A ship. Reverse: IN . BELFAST . MARCHT = A bell. I . K.
Obverse: WILL . LOKART . THO . AITKIN = Prince of Wales’s feathers. L . A.
Obverse: GEORGE . MARTIN . OF = R . M. within a merchant’s mark. Reverse: BELFAST . MARCHAN = 1D. A bell. 1666. George Martin was elected Sovereign (Mayor) of Belfast in 1649 but, due to the political difficulties of the Great Rebellion in Ireland and the Civil War in England, he never actually took up office. He refused to billet Confederate troops, who then pillaged his house, seized his goods and confiscated his estates. Another token of George Martin’s, very similar to the above, is dated 1637, and has the initials G . M. on the merchant’s mark. This is a remarkable date, there being no other token prior to 1648 and in Ireland none earlier than 1653. The date is most probably an error for 1657. Obverse: GEORGE . MARTIN . OF = G . M. within a merchant’s mark. Reverse: BELFAST . MARCHAN = 1D. A bell. 1637. Obverse: IOSIAH . MARTIN = Unknown. Reverse: IN . BELFAST . 1657 = Unknown. Obverse: GEO . MICCARTNAY = G . M.
Obverse: GEORGE . MICARTNEY = G . M. 1D. Reverse: OF . BELLFAST = 1657. Obverse: WILLIAM . MOORE . IN = A ship. Reverse: BELFAST . MARCHANT = 1D. A bell. Obverse: ALEXANDER . SINKLAR = A ship. Reverse: IN . BELFAST = A . S. 1D. 1657. Obverse: HENRY . SMITH . IN = H . S. 1D. Reverse: BELFAST . MERCHT = Arms of the Smith family : a saltire, a crescent in chief and a trefoil in base. Obverse: WILLIAM . SMITH = W . S.
Reverse: IN . BELFAST = 1D. William Smith was a wealthy merchant in Belfast who died in 1684 and left his son (David) the then huge sum of £3,600. David Smith was Sovereign (Mayor) of Belfast in 1699 and, again, in 1700. Reverse: OF . BELFAST = 1657. Obverse: HVGH . SPEIRE . MARCHNT = H . S. A merchant’s mark. Reverse: IN . BELFAST . HIS PENNY = The same as the obverse. Obverse: IOHN . STEWARD . OF = A ship. Reverse: BELFAST . 1656 = 1D. on a bell I. S.
Obverse: IOHN . STEWART . HIS . 1D . 1657 = A bell I . S.
Reverse: THE . ARMES . OF . BALFAST = Arms : a ship. Obverse: ROBERT . WHITSIDE . IN = A ship. Reverse: BELLFAST . MARCHANT = 1D. R. W. 1667. The bell and ship on the Belfast tokens are the bearings in the Arms of the Borough. It is thought that this name refers to Ballymena, Co Antrim. Obverse: WILLIAM . ADARE = A full-blown rose. Reverse: IN . BELLIMINOCH = W . D . A. 1. Obverse: ROBART . BOYD . MAR = A squirrel seated on a mound. Reverse: IN . BELLEMANOGH 1D. Obverse: IOHN . HARPER. MARCHT = I . H. over a harp. Reverse: IN . BELEMENOCKE = 1D. Obverse: IOHN . WALLAS . MARC = 1671. 1D. Reverse: IN . BELLEMENOCK = I . W.
Obverse: AT . THE . DOLPHIN = A dolphin. Reverse: IN . BELLINALEE = P . C.
Obverse: ROBERT . HARES . AT = A pair of shears. Obverse: RICHARD . HARRISON = A man and horse. Reverse: BELTVRBAT . POSTMR = 1D. Obverse: MARCVS . ARCHER. OF = Coat-of-arms. 1D. Reverse: BIRR . MARCHANT = M . N . A. 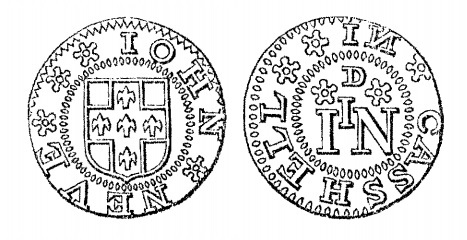 A variety of above is countermarked HAPNEY, and probably passed for a halfpenny. Obverse: RICHARD . ARCHER = R . A. 1667. Reverse: OF . BIRR . MARCHAN = Coat-of-arms. Obverse: MICHAELL . CANTWELL = M . C. 1D. Reverse: OF . BIRR . MARCHANT = M . C. Arms of the Cantwell family : five annulets, a canton ermine. Obverse: BY . ROBERT . IEFFES . OF . BIRR . TO . PASS . FOR 1D. (in six lines). Reverse: IN . NECESSARY . CHAINGE . WITH . LABOVRERS . AN . OTHERS (in five lines). Obverse: THOMAS . LANGTONN = T . L. 1D. Reverse: BIRR . MARCHANT = A thistle. Obverse: THO . CVSACK . AT . BLACKWROTH = A sword. Reverse: IN . THE . COVNTY . OF . KILDARE. Obverse: THOMAS . WOOLLFORD = A bell. T . C . W.
Reverse: MARCHANT . OF . 1668 = BVRRISCANE. 1D. Obverse: STEPHEN . RADFORD = A lion. Reverse: BVRRESOLE . MARCH = 1D. Obverse: CORMOCK . DERMOTT . OF = A boar. Reverse: ABBEY . BOYLE = 1D. 1658. Obverse: STEPHEN . DOWDALL = A duck. Reverse: OF . BOYLL . MERCHANT = S . D. | 1D. Obverse: EDWARD . MVNNS = A knot. 1D. Reverse: IN . BOYLE . 1678 = Arms : three bezants, on a chief four others. Obverse: SAMVEL . ANDREW . MRT = 1D. An ornamented knot. Reverse: IN . BROVGHSHAIN = S . A. Merchant’s mark. Obverse: IOHN . SPEARE . OF = I . S. 1D. Reverse: CALLEDON . TANER = A dog. Obverse: IOHN . MASTERS . 1657 = 1D. Reverse: IN . CARTHELOVGH = A bull. The issuer was Portreve of Carlow in 1660, and is named in “The Sufferings of the Quakers” as having caused to be apprehended in that year twelve Quakers for meeting together in the fear of the Lord, and he committed them to prison till the next Session without examination or Mittinius. They were afterwards fined £320. The Portreve resided “within ye gate,” and his name is returned in that district of the town now representing Dublin Street in a schedule to an applotment of vestry cess made October 13, 1669, in which he is assessed at 10s., being the highest amount charged upon any individual is the list. Obverse: THOMAS . MOORE . OF = A stag. Reverse: CARLO . POSTMASTER = 1D. The name of Moore appears in the vestry assessment of 1669, but this particular issuer is not named. he name of Thomas Moore does not appear in the vestry assessment of 1669, on which, however, we find a 4? John Moore” residing ” without ye gate, and a ” Peter Moore,” an inhabitant of Tullow-street. Postmasters’ tokens are also known for Antrim, Belburbet and Youghall at this time. Obverse: GARRETT. QVIGLEY = A harp. Reverse: OF . CARLO . MARCH = G . Q. 1D. James II. seized to himself all the liberties and privileges of the town, by a decree of his Court of Exchequer, of his own “special grace, certain knowledge, and mere motion” ; the charter granted by the late King was abrogated, and another granted in its stead, bearing date February 24, 4th year of reign Jas. II. By it the King did “make, nominate, and contstitute Garrett Quigley, merchant, to be time first and modern soveraigne of the said burrough.” John Quigley (probably a near relative of the sovereign) was also nominated in the charter Town Clerk for life. The Quigleys were of a Munster stock, hailing from county Tipperary. 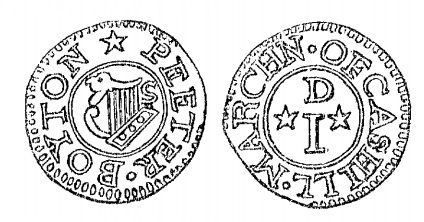 “Garret Quigley in Lisma lin 1659” is the inscription on a token, quoted in Dr. A. Smith’s Catalogue, communicated to the Royal Irish Academy in 1849. Whether this was the same individual as the Garrett Quigley of Carlo can only be matter of conjecture; but if he emigrated from Lismalin and settled here, he must have done so prior to 1669 (when he was named in the vestry documents). He appears to have resided in Dublin Street, and, judging from the amount of his assessment, probably, occupied one of the best positions in the town. He is said to have taken away the oak timber from the castle of Carlow, and with it roofed the houses at the Market Cross during the year of his reign over the town. Obverse: EDWARD . RENOLDS = Arms of the Reynolds family : a lion rampant between three escallops. Reverse: OF . CARLO . MARCHANT 1D. In 1675, King Charles II. granted a new charter to the borough of Catherlough, in which His Ma jesty appointed Robert Browne, Esq., to be sovereign, and in which he named “Edward Reynolds, gentleman,” in company with Sir John Povey, Knight, Chief Justice of the Court of Chief Place in the Kingdom of Ireland, Sir William Temple, Bart., John Nicholas, Esq., Robert Browne, Esq., John Warren, Esq., Robert Curtis, Michael Headey gent., Samuel Blackshaw, gent, Sir Thomas Butler, Bart., Sir John Davellier, Knight, Henry Berkeley, Esq., and John Tench, gent., to be the first and modern twelve free burgesses of the said borough, Mr. Reynolds ranking fifth on the list. Mr. Reynolds succeeded Mr. Browne as sovereign of the borough. His last recorded attendance at vestry was on the 26th of April, 1686; and as we miss his name from “An Account of those that hath seats in Church of Carlo, and paid their money for, to Samuel Keeler and Henry Carter, Church wardens for the Parish in the year 1694,” but find therein the name of “Mrs. Mary Reynolds” (probably his widow), we presume him to have died in the interval between the years 1686 and 1694. Obverse: THO . REYNALDS = Arms of the Reynolds family. Reverse: OF . CARLOW . TANER = 1D. Obverse: PETER . AYLWARD = Arms : two fleurs-de-lys in chief, a crescent in base. Reverse: CARRICK . MARC = 1D. Obverse: WALTER . DEVEREVX = W . D . in monogram. Reverse: OF . CARRIKE . MAR = H . A. 69. Obverse: HENERY . BVRNES = A castle. Reverse: IN . CARICKFERGVS = 1D. and two roses. Obverse: ANTHONY . HALL . IN = A castle. 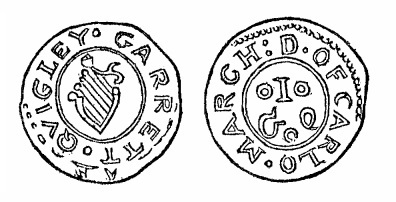 Reverse: CARRICKFERGVS . 1656 = = A . H. 1D. Another similar, half the size, and without date. Reverse: CARRICKFERGVS . = A . H. 1D. This has been struck on another coin. Obverse: A . H . 1D. filling the field. Reverse: C . F . B. = A castle of three towers. Obverse: WILLIAM . MAGEE . OF = A castle. Reverse: CARRICKFERGVS = 1D. W . M . G.
Obverse: IOHN . WADMAN = A castle. Reverse: CARRICKFERGVS = I . W . D. (for the issuer’s initials, and 1D.). Obverse: ANDREW . WILLOVGHBY = A castle. Reverse: OF . CARRICKFARGVS = A . W. 1D. Obverse: W . B . AT . CARRACKNAKROSS = Arms : three boars’ heads. Reverse: WHEN . YOV . PLEASE . ILE (CHAINGE . THES in a second circle), in the centre 1D. W . B. are the initials, and the arms are those of William Barton, Esq ., who rented the barony at the period. Obverse: PHILIP . DAYE . MARCHANT = A stag trippant in a shield. Reverse: OF . CARRICKMASHVRE = 1D. Obverse: PEETER . BOYTON = A harp. Reverse: OF . CASHILL . MARCHN = 1D. with two stars of five points. Peter Boyton is one of the subscribing witnesses to the will of Edward Mihill, dated February 6, 1663 (see hereafter). The name appears amongst the names of Common Council and Aldermen appointed in 1687 by the charter of James II., and amongst those in the marriage registry of about that date. In the old cathedral upon the rock there is a small shield, upon which are the arms of Boyton, three spur-rowels, with the name of Boyton in old English letters. There is a townland of the name of Boytonrath within a few miles of the city of Cashell. Obverse: EDMOND . KEARNEY = A plain cross, with a pellet in each quarter. Reverse: CASHELL . MARCT = E . K . 1D., with four small annulets. Obverse: EDMOND . KEARNEY = A plain cross, with a rose in each quarter. Reverse: CASSHELL . 1666 = 1D. Obverse: EDMOND . KEARNEY = A cross patée. Reverse: CAS | SHEL | HALFE | PENY (in four lines). Obverse: EDMOND . KEARNEY = A cross, with a pellet in each quarter. Reverse: CASHELL . MARCHT = E . K. with four annulets and 1D. Reverse: CASSHELL . MARCT = E . K. 1D., with four pellets (the D over the I is reversed). The issuer was one of the Common Council appointed under the charter above mentioned, and by the same charter two of the same name were appointed Aldermen, and three of the same name Common Councillors, so that evidently the family was of some importance at the time. The issuer was most probably connected with the Roman Catholic Archbishop of Cashell, David Kearney, who was descended from a family whose name was long honourably connected with Cashell, and who was born in 1568. It is probable that from this dignitary the crozier which belonged to St. Patrick came into possession of the Kearney family, in whose hands the precious relic remained until handed over to the late Most Rev. Dr. Stattery, Roman Catholic Archbishop of Cashell ; and it now constitutes a part of the crozier in the possession of the present Archbishop. The relic, the authenticity of which can be proved by legal evidence, conferred upon the family of its possessors the proud title of “Kearney Crux.” Monuments to various members of the family in Cashell attest to the importance of its status in the seventeenth century. Obverse: EDWARD . MIHILL = A cathedral. Reverse: OF . CASHALL = E . M. 1D. and five stars of five points. The issuer is believed to have been a retired trooper of Cromwell’s, and his will appears in the district registry of the Probate Court, Waterford, and in it he bequeaths all his properly to his wife, and appoints her sole executrix. It is dated February 6, 1663, and probate was granted June 10, 1663. Obverse: IOHN . NEVE = Arms of the family : on a cross five fleurs-de-lys. Reverse: IN . CASSHELL = I . N. 1D. The name of John Neve, sen., is found as witness to a will of John Neve, dated 1667, and a John Neaves was buried February 28, 1672. The will of John Neve, dated December 25, 1667, is in existence, and is supposed to be the will of the issuer ; and the family continued to reside in Cashell until the year 1820, when it became extinct by death. Obverse: IOHN . PEENE = The Arms of the Neve family, as above. Reverse: IN . CASSHELL = I . P. 1D. and two cinquefoils. The token is very rare, and the name has not been found at present in the documents or archives of Cashell. There are poor people of the name of Pyne in Cashell, who are probably descended fiom the issuer. Obverse: ROBART . PRINCE = A castle. Reverse: OF . CASHELL . 1664 = 1D. and two stars of five points. Robert Prince was City Treasurer ; there are several entries in the old Corporation Books in which his name is mentioned: in 1672, Mr. Robert Prince to pay £5 to the Town Clerk. The following order was made May 3rd, 1673, and is interesting of itself: ” A tanckard of the value of £10 voted to Richard Melsam, late Mayor, as a signal and remarkable token of the Citties thanks for his good service in his Mayoralty, more particularly for his strong opposing of the seditious rebels pretending right to the King’s sword, and to the Mayorial Jurisdiction and government of the said Citty;” and it was ordered ” that Mr. Robert Prince forthwith pay unto Mr. Joseph Demors hand the sum of ten pounds ster. afores1 for the said use,” this was no doubt ” Darner” of whose riches fabulous stories are told, and who built the Court at Shronell; he was a common councilman of Cashel, and lent money to the Corporation. June 12th, 1677 “Ordered that Mr. Robert Prince should have a lease of that stone slated house, situate in the middle row in Cannafee street, opposite the water pype. 28th Sept., 1678 “Ordered that Mr. Robert Prince doe pay out of this half years rent, ending at Michaelmas 1781, to ye Lord Lieutenants Serjeants at Mace, the sum of fifteen pounds sixteen shillings and eight pence, and seven shillings and sixpence to Thomas Robinson, Esq., Mayor of this Citty, for money expended by him for their treatment. 15th December, 1683. “£50 to be raised in order to the renewing of the Charter.” Robert Prince, Alderman, lent the amount to the Corporation. Obverse: ROB . BRICE . AVTH . OF = Arms : in chief three mullets, in base two crescents. Reverse: CASTLECHICHESTER = 1671. 1D. Obverse: THOMAS . ADERLY = A horse-shoe. Reverse: CASTLE . DERMOT . SMITH = 1D. A hammer and pincers in saltire. Obverse: THOMAS . CLINTON . OF = A lion gardant to the left. Obverse: HENERY . MARRENER = A glove. Reverse: OF . CASTLEDERMOTT = 1D. Obverse: IOHN . CALHOVNE = A cask. 1D. Reverse: OF . CASTELFIN = I . C. A merchant’s mark. Obverse: IOHN . BALLARD = A swan. Reverse: IN . CAVAN . 1667 = I . M . B.
Obverse: THOMAS . CHADS . MERCHANT = Two guns crossed. Reverse: IN . CHARLEMONT = A castle. Obverse: EDWARD . PARREY = 1D. Reverse: CHARLEY . MOVHT = St. George and the Dragon. Obverse: IOHN . BVTTELER . IOHN . EXHAM = A star of eight points. Reverse: IN . CHARLEVILLE . 1668 = A Catherine wheel. Obverse: ROBERT . COWEN . IN = A thistle crowned. 79. Reverse: CHARLEVILLE = A castle ; the Arms of Charleville. Obverse: A . W . PENNEY . 1667 = A bear with chain. Reverse: C . CHARLIVELL = St. George and the Dragon. Obverse: EDMOND . YEOMANS . HIS . PENNY = IN CORKE . 78. Two busts facing each other. Reverse: The Fruiterers’ Arms. CHARLEVILE counterstruck across the field. Obverse: CLARE = A castle. Reverse: LIMERICK = A castle. In Clare, there is only one known issuer, a merchant called David White. Interestingly, the name of David White, a Limerick merchant, appears among those transplanted from Limerick during the Cromwellian Plantation. Following the Cromwellian settlement, new settlers had replaced the pre-1641 Limerick merchant families. These were original Old English Catholic merchants and were forbidden by law to live in walled towns, who then settled in Ennis. One such family were the Whites. This family first came to public attention when James II appointed a man called David White as the Provost, or Portreve of Ennis, while Andrew White, also a merchant, became one of 12 burgesses who together with the provost, elected the two members to represent the borough in Parliament. 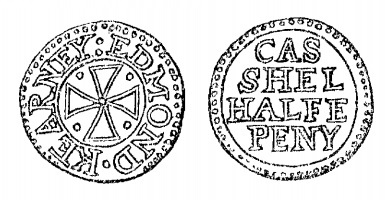 David White issued both half-penny and penny trade tokens. Reverse: CLOVGHNIKILTY . PENNY = Counterstruck I . B . FAR THING. Reverse: CLOGHNIKILTY . PENNY (not counterstruck). The old name for Clonakilty was Clochnakilty. Obverse: WILLIAM . PARKE . IN = 1664. 1D. Reverse: CLOWNIS . MARCHAN = W . P.
Obverse: IOSEPH . SCOFIELD = Three crowns. Reverse: IN . CLOVNIS . 1670 = 1D. Obverse: THO . BVTLER . MARCHANT = Two croziers in saltire. T . B. 1D. Reverse: OF . CLONFERT . 1676 = A mitre. Obverse: THO . BVTLER. MERCHANT = Arms : three covered cups. Reverse: OF . CLONFERT . HIS . HAPENY = A mitre. Obverse: IAMES . COLMAN . IN = A swan. 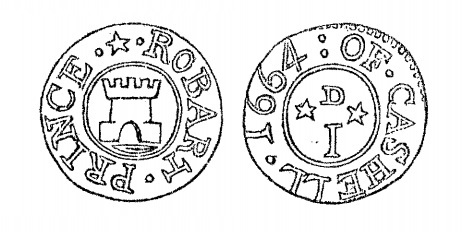 Reverse: CLONFERT . MARC = I . C. 1D. Obverse: CLONMEEN . PENNEY = T . C. 72. Reverse: A horse under a tree, a harp at the side. Obverse: I . B . OF . CLONMELL = 1658. 1D. Reverse: FOR . CITTY . AND . COVNTY = A bridge, on which is a stag pursued by a dog ; a fish below the bridge. Obverse: RICHARD . CARLETON . OF = A bridge of five arches, on which is a stag pursued by a dog. Reverse: CLONMELL . MERCHANT = R. C. | 1D. Reverse: OF . CLONMELL = G . C. 1D. 1656. Obverse: IOHN . FRYERS . 1668 = A ship. Reverse: OF . CLONMEL . PEVTERER = 1D. Obverse: RICHARD . HAMERTON = 1657. Reverse: IN . CLONMELL . 1657 = R . H.
Obverse: RICHARD . HAMERTON = A bridge of five arches, on which is a stag pursued by a dog. Reverse: OF . CLONMELL . 1664 = A fish. Obverse: RICHARD . HAMERTON = A dolphin. 1D. Obverse: RICHARD . HAMERTON = R . H. between two dotted circles. Reverse: OF . CLONMELL = 1657. Obverse: IOHN . HARWOOD = Three fleurs-de-lys, two and one. Reverse: OF . CLONMELL . MA = 1D. Obverse: ANN . HENBVRY = A harp. Reverse: IN CLONMELL . 1663 = A . H.
Obverse: WILLIAM . HENBVRY . OF = A harp. Reverse: CLONMELL = 1656 | W . H.
Obverse: ANDREW . ROBESON . OF = Arms of the Robison family : three stags. Obverse: THOMAS . ADAMS . IN = A pestle and mortar. Reverse: COLERAINE . APOTHECARY = Arms of Coleraine, in a shield. Obverse: IOHN . BROWNE . MARCHT = Unknown. Reverse: IN . COLERAINE = Unknown. Obverse: R ….. BROWNE . MARCHANT = Arms. Reverse: IN . COALRAINE = R . B. 1D. Obverse: WILL . GODFREY . MARCHANT = Arms. Reverse: IN . COLERAINE = W . G. 1D. Obverse: ALEXANDER . MILLER . 1665 = A cross ; with a sword, a fish, 1D., and a rose, in the quarters. Reverse: IN . COLRAINE . MARCHANT = Arms ; three garbs and three stars. The Arms of Coleraine are a cross with a sword erect in the first quarter, and a fish in the second. Obverse: WIL . ROSE . OF .COLRAINE = A bear passant. Reverse: EXCHANGE . FOR . A . CAN = A rose on its stalk. The device of a rose refers to the issuer’s name, the bear to the article “beer,” which the token was changeable. Another Boniface’s double-entendre is on a token of Thomas Dawson. Obverse: IOHN . TWADDELL . MART = Arms. Reverse: IN . COLERAINE . 1667 = 1D. I . T.
Obverse: GILBERT . WILLSON = Arms, in shield 76. Reverse: OF . COLERANE . MART = A merchant mark between G . W.
Obverse: HENNERY . DOWDALL = H . D.
Reverse: OF. COOLLVNY . MARC = 1671. 1D. Obverse: IA . BROWNE . FARMER = 1D. in a wreath of flowers. Reverse: OF . EXCISE . IN . CONAGHT = Arms of the Browne family a double-headed eagle displayed. Obverse: Two large thick strokes and 1646, with a double circle. Reverse: A ship within a double circle, square and very rough in work. Obverse: A castle within a dotted circle. Reverse: CORK within a dotted circle, square and very archaic in appearance. Reverse: CORKE and a crown over, with a small double circle stamped near the edge of the piece, a rough, jagged piece of brass, oval shape, weight fifty-six grains. Obverse: A . CORK . PENNY . 1659 = C . C. [City of Cork]. Reverse: THE . ARMES . OF . CORK = A ship in full sail between two castles. Obverse: A . CORCK . HALFE . PENNY = A ship and castle. Reverse: C . C. 1656 within an ornamented border. Obverse: A . CORKE. FARTHING = Arms : St. George’s cross. Reverse: A . CORKE . FARTHING = Arms : a harp. 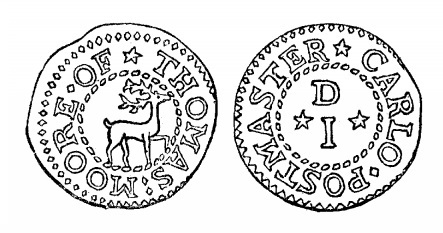 There are two sizes of this token, one about the size of a halfpenny, and the other farthing sized. Obverse: WILLIAM . BALLARD . HIS . PENNY = CORKE . 1677. Reverse: (No legend.) The King’s bust, and three crowns on the royal oak ; below a horseman, and a soldier on foot. This is thicker than the ordinary tokens, and has an inscription on the edge in raise letters. A variety of this token has a countermark on it of “Corke” in a small beaded cross. Obverse: IAMES . BRATIAN . IN = A harp. Reverse: CORK . MARCHANT = 1D. over I . S.
Obverse: EDWARD . GOBLE . OF = A castle between E . G.
Reverse: CORK . BRAZIER . 1672 = A brazier. Obverse: EDWARD . KAVANACH = Unknown. Reverse: OF . CORK . MARCHAN = Unknown. Obverse: P . M . MAYOR . 1658 = CORK . CITTY. Reverse: (No legend.) A ship between two castles. The initials are those of Philip Matthews, Mayor of Cork 1658. Obverse: IONAS . MORRIS . OF . CORK = I . M. 1657. Jonas Morris was Mayor of Cork in 1651. Obverse: IONAS . MORRIS . OF . CORK = I . M.
Reverse: The Arms of Cork : a ship between two castles. Obverse: EDMON . YEOMANS . HIS . PENNY = Two busts facing each other IN CORKE . 78. Obverse: EDMOND . YEOMANS . HIS . PENNY = Two busts facing each other IN CORKE . 69. Obverse: GEORGE . YOVNG = A castle. Reverse: IN . CORKE = G .Y. Obverse: EDWARD . CAVENACH = A boat. Reverse: OF . COWRY . MARCHT = 1D. Sorry to post this here. but I was wondering whether you had any Irish Tokens of Gregory Kane from Dame Street (He was a Camp Equipage and Portmanteau maker). I looked hard but couldn’t find an email address to email you privately. I had some but they’re long gone. Kane had several addresses (different numbers) on Dame Street in Dublin. His tokens have particularly nice designs and are highly sought after. I’ll keep you in mind whenever I get some again.